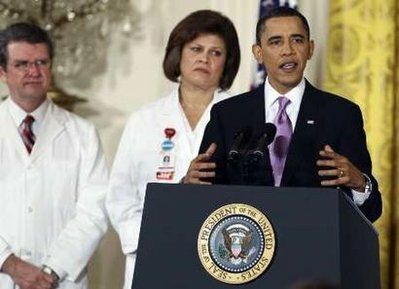 President Barack Obama faces skepticism on his latest revised health care plan not only from Republicans but also from Democrats who have one eye on polls and the other on a tough re-election campaign in 2010. Obama Wednesday called on Congress to put aside a year of partisanship and bitter divisions over his faltering health care “reform” program and pass the measure in a simple, up-or-down vote by the Easter recess at the end of March. Democrats aren’t so sure his latest ploy will work. Democratic Rep. Joe Courtney of Connecticut has his doubts too. Speaker of the House Nancy Pelosi is working to win over some of the 39 Democrats who voted against the reform bill the first time around in the House. She will need those votes. Sadly, our Democratic representatives do not want health care reform passed any more than Republican ones want to pass anti-abortion legislation. In either case, the party loses a key issue that keeps the rank and file in line. Without these issues, voters may come to realize that there is hardly enough space between the two parties’ policies to slip a knife edge, nor does either care about anyone with an annual income less than seven figures. If you can’t even finish a bill on mandatory health care insurance, why do you think you can run our nations health care system? Lock, load, safety on, Welcome Dave R and please reply, why do we allow the 90degree argument by less than journeymen plumbers when in fact the clog of the drain persists as these wars? Hence, before we tackle health we are leaving blood everywhere? Should we not question intensely, demanding as you have a focus on puffed up partisanship and disregard for purpose when 4th graders have the further grasp on parliamentary procedure? If the American people are not granted the Oscar for least supporting actors.. Finish for me Woody, please. I’m beginning to think this President is spring-loaded in the ‘stupid’ position. He doesn’t seem to get the message that “We the People” don’t want his/their corporatist friendly health care bill. President Obama is no friend of the people…period! I am sick of hearing all this talk about the Senate pushing for “reconciliation” of their bill. Take a minute for some elementary school level understanding of how the political process works. replace the bill they just voted for. Here is what I predict will happen IF the House does indeed pass the Senate’s rushed through bill from December. There will be too many items that the Parliamentarian will rule impermissible for budget reconciliation and the Senate will be unable to then actually pass a “reconciliation” bill that could also pass in the House. Then Nancy, Harry and Barack will say well we tried and just could not iron out the differences and it’s all the Republicans fault. Therefore, Barack will “reluctantly” sign the House approved Senate bill because they “have” to pass something. 1. The House and Senate agree up front to accommodate changes wanted by the House to the current Senate bill. The House passes the Senate bill as it is. 2. The Pres vetoes it. 4. The House passes the new Senate bill as amended. 5. The Pres signs it. 1. The House does not trust the Senate. 2. Why would he veto it – see the issue I bring up with your step 4. He get’s to blame the Republicans for a failure with reconcilation. 3. No VP has overruled the parliamentarian since Humphey. 4. Remeber there are three special elections coming up by the end of the month. Republicans stand a good chance of picking up those seats. If they do then there is now way the House could pass the Senate’s currnet bill to say nothing of the reconciled bill being able to pass either. 6. However if the stars do align for the Democrats then your step 6 is right on the money. We are screwed. with your blind eyes a crying, your reps twisting, and your guilty bat too heavy to swing for even a single. So is the foul smell of war for profit ! Smell it ! Heck I have no idea within all the chaos where to focus my anger but at War. It must be fun and powerful to not know the drag. If your #1 is correct – no bill.